Today is International day of the Midwife. We celebrate by honouring those midwives at Buburi Health Centre who are supporting women and enabling healthy births every day. Together they educate and inform mothers and communities that to ensure a safe birth and a healthy baby you should have a Midwife guided pregnancy and skilled attendance on that all important day. Trustee Noreen Collins and volunteer Clare Nicholls attended many births during their recent visit to the clinic, the most challenging being a baby boy who wanted to enter the world one foot at a time! This mother would normally be referred to a hospital with theatre facilities for a caesarian section but there was no time for that, baby was in a hurry. So rusty skills were summoned and baby Collins Nicholls! was safely welcomed into the world. He took a long time to cry after his difficult journey but rewarded his mother with a lusty wail at long last. 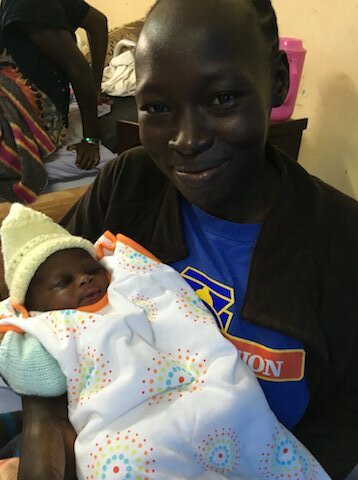 His mother Beatrice was so thankful she had chosen to deliver her baby at Buburi, the outcome may have been very different if she had chosen to deliver at home.